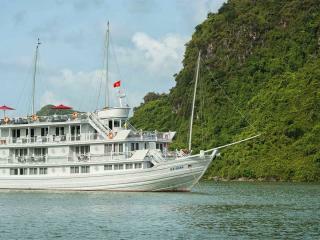 Enter the mystical landscape of Halong Bay, in the Gulf of Tonkin a board Paradise Luxury 3 day and 2 night cruises. With over 2000 incredible geological formations known as karsts jutting from the serene waters, it is no wonder that this region is World Heritage Listed. 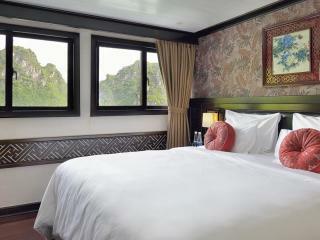 Halong Bay can be found within a three hour drive from Hanoi, the capital city of Vietnam. 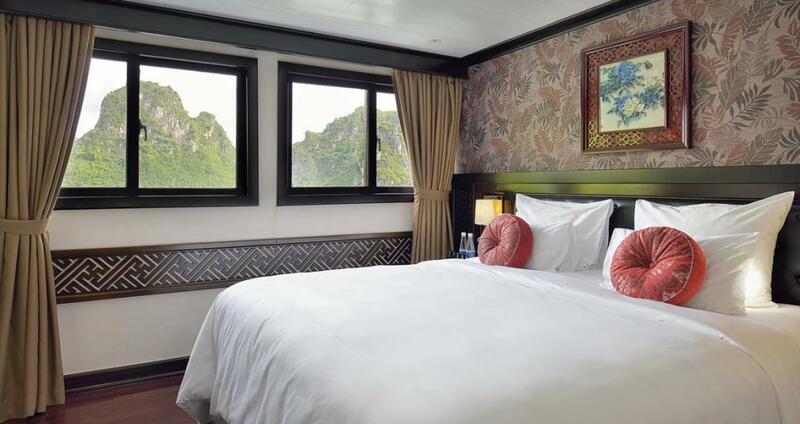 This cruise departs from Tuan Chau Island and itinerary includes locations such as Bai Tu Long Bay, numerous caves, Vung Vieng Fishing Village and Thien Canh Son cave to name a few. 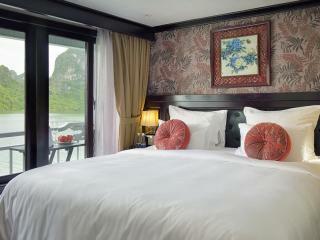 The facilities on board the Paradise Luxury vessels are incredible. 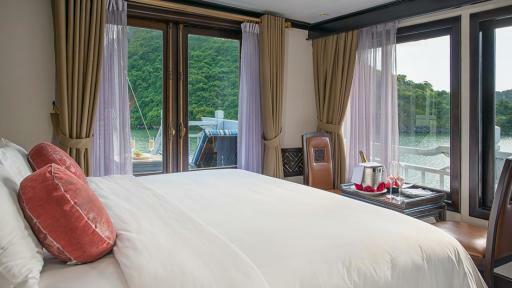 These purpose built boats are intimate with only 15 cabins but are spacious with four decks, that include facilities such as a spa with massage rooms and Jacuzzi. 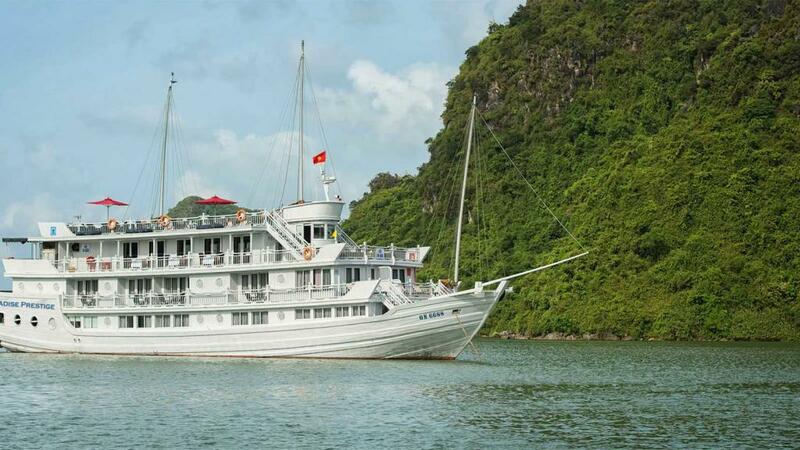 If you are looking for a unique and luxurious cruising escape on Halong Bay, this tour should be on the top of your list. 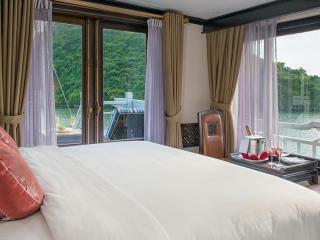 Each of The Paradise Luxury vessels has 15 cabins. 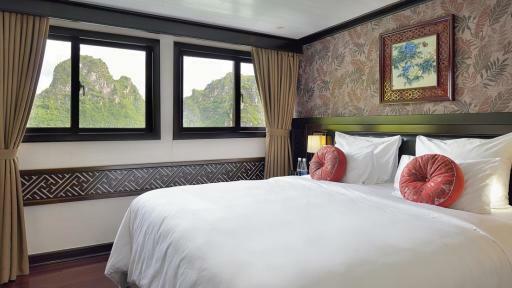 All cabins are stylish in design with wooden floors and feature incredible vistas from the cabins of the beautiful Halong Bay. 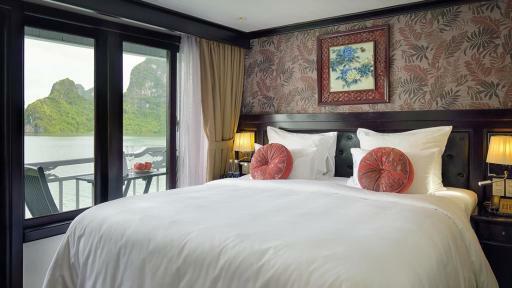 Passengers can choose from four elegant types of accommodation. * Except for Paradise Prestige Vessel 1, which has no Terrace Suites. 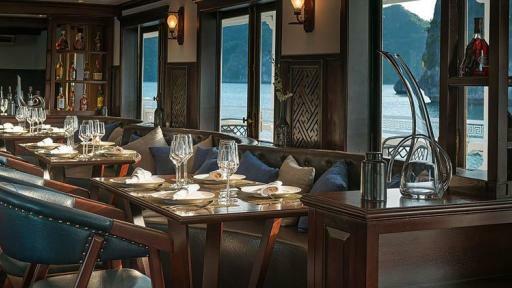 The restaurant and bar on board the Paradise Luxury Cruise vessels are a great place to enjoy the stunning surrounds of UNESCO World Hertiage Listed - Halong Bay and mingle with other guest to share your travel stories. The menus are a fusion of Vietnamese and European cuisines. 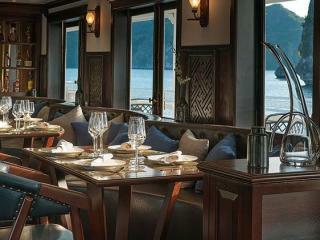 The restaurant can be found on the Terrace deck of the vessels. Whilst on board, you have the opportunity to take part in the following activities. 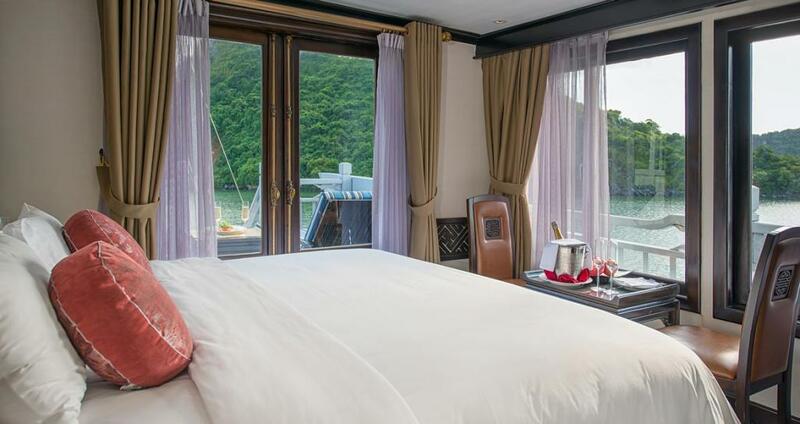 There is also an extensive range of spa services on board which include treatments such as - Aromatherapy Massage, Traditional Vietnamese massage, traditional Thai Massage and warm stone massage and many more. These are not included in the cruise price. Note: Passport and visa information will be required for advance registration prior to departure. Cruise itinerary is subject to change due to weather or operating conditions without prior notice. Limited Wi-Fi is available on board. Luxury’s passengers do not have to switch the boat neither return to port on the second day. 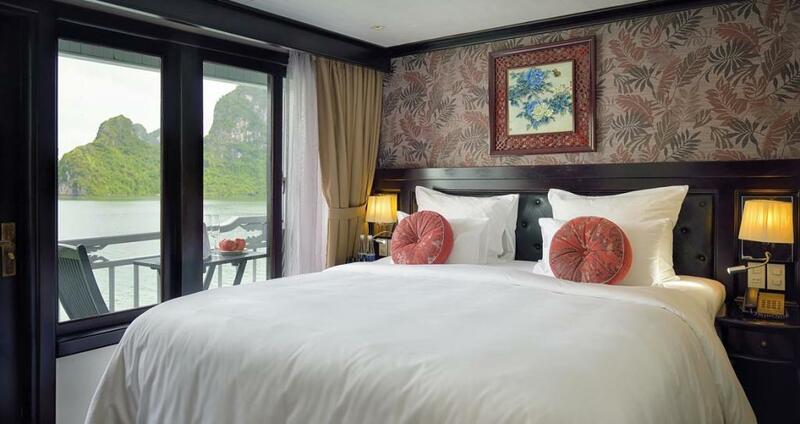 While other cruises will transfer their guests to a day-boat after the first night, Paradise Luxury comfortably accompanies you throughout the whole journey. Spa treatments are available at selected times daily.